A circular from Malham, taking in all the natural wonders the area has to offer. Malham is a small village in the Yorkshire Dales, but is a great draw amongst walkers, ornithologists and tourists in general, due to the easy accessibility of the natural wonders surrounding it. The walk starts in the village centre and follows Malham beck and then Gordale beck, before passing through a delightful wooded area to reveal Janet's Foss, a waterfall set in its own little amphitheatre. A few yards further on, Gordale Scar is reached, a gorge with limestone cliffs over 100m high. The walk retraces its steps to Gordale bridge and then on over a short climb to reach the limestone pavement above Malham Cove. After admiring the pavement, head down to the foot of the cove and away from it to reveal the cove in its full splendour. The cove is over 80m high and 300m wide and once was the site of a waterfall higher than Niagara falls! The cove is a favourite with ornithologists, with the peregrine falcon a visitor here. 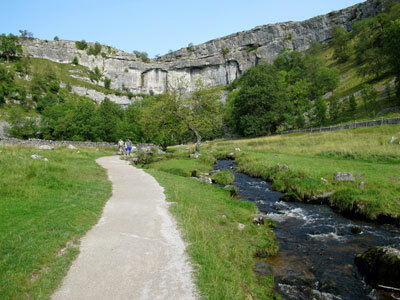 From the cove, a gravelled path is followed back to the road, which leads through Malham back to the car park. Parking: Pay and display car park in Malham (grid reference SD 900 626) - small amount of road side parking available, but please park responsibly as Malham does get very busy, especially at weekends and bank holidays. The walk starts from the pay and display National Park Centre car park in Malham. Exit the car park by passing in front of the National Park Centre building and turn left along the road. Pass the church and a café and then before you reach the Buck Inn, cross the road just before the Malham Smithy and pass to the right of it, then immediately cross a stone bridge over Malham Beck and then turn right along the gravelled path, following the sign for Janet's Foss. Continue on through a couple of gates towards another gate ahead. Pass through the gate and turn left, following the footpath sign for Janet's Foss. Continue on along the path through kissing gates and along a flagged section to reach the next gate to enter in to 'Janet's Foss - Malham Tarn Estate'. Walk along the undulating beckside path through the woods. After a few minutes walking, Janet's Foss is reached. Foss is the old Scandinavian name for waterfall. According to legend, Janet (or Jennet), queen of the fairies, lived in a cave behind the waterfall. To continue, pass by the side of the information board and alongside the wall and up a short climb, to pass through a wooden gate before turning right on to the road. Head along the road past the remains of a wall to reach the layby by Gordale Bridge, which will be returned to after visiting Gordale Scar. Keep on the road passing the layby and after a further 50 metres, turn left off the road through the gate following the footpath sign for 'Gordale Scar 1/2m'. Walk along the gravelled path to reach the waterfalls of Gordale Scar. Over the last 1.5 million years, Malham has been covered by three great sheets of ice. Each time the glaciers melted the water and moving rocks scoured away the rocks, leaving the gorge that we see today. The scar itself has been the subject of an 1818 sonnet by William Wordsworth and was painted by J M W Turner and also by James Ward, which can be seen in Tate Britain. After admiring Gordale Scar, turn around and head back along the path and upon reaching the gate, turn right back on to the road. Head along the road for about 50 metres and turn right over the bridge over Gordale Beck in to the 'layby' and head towards the wooden kissing gate a few metres further on. Pass through the kissing gate and walk away from the wall on the path following the footpath sign for 'Malham Cove 1 mile'. The path heads to a wall corner and then continues along the left hand side of the wall. Walk along this now wide grassy path until a wooden kissing gate is reached, all the while admiring the ever expanding vista behind as height is gained. Pass through the kissing gate and head diagonally right across the next field towards the stone steps and gate in the corner of the field. Climb the steps, pass through the gate and turn left alongside the wall. Head down to and pass through a wooden gate at a wall junction and continue on up alongside same wall. Keep on this gravelled path along the right hand side of the wall, eventually passing by a telegraph pole before pulling in alongside a wall. Continue up to and pass through the gate and turn right on to the road. Once on the road, turn almost immediately left over a stile on the opposite wall. Head directly away from the wall on the wide path, over a slight rise and then keep on in the same direction. After a couple of hundred metres as the path slowly climbs on to Sheriff Hill, the path pulls in besides a wall corner and then heads along the right hand side of the wall towards a sign. At the sign on the wall corner, head diagonally left towards the limestone pavement on top of Malham Cove following the sign 'Malham Cove ¼ mile'. The path drops down towards the top of the cove. As you approach the cove, pass through the wall gaps or climb the stile to get on to the pavement and then head away from the wall across the pavement. If you feel you will struggle walking across the limestone pavement, walking is a little easier to the right. The left hand side is unfenced and there is a big drop, so stay well away from the edge. Once across the pavement a wall is met. Turn left down the side of the wall to quickly reach a wooden kissing gate. Pass through this and turn left to head down the man made steps and pass through a wooden gate. Continue on downwards as the steps get steeper, passing under a tree, before reaching yet another gate. Pass through the gate. The direct route back is the right hand fork, but for a short diversion to the bottom of the cove, take the left hand fork. Head down along the path as it pulls in alongside the water. Pass through a wooden gate and head along the rocky ground to the base of the cove. The water emerging from the base of the cove comes from Smelt Mill Sinks, ¾ mile northwest of the cove. The darker vertical stripes on the limestone are formed by mosses and lichens in the dripping water. The horizontal ledges in the limestone are due to differences in the hardness of the limestone. Head back over the rocky ground to pass back through the gate. Continue straight ahead on the gravel path by the side of the water. When you get a little further away from the cove, you can then appreciate its shear size - over 80 metres high and 300 metres wide. At one point in its history, water which then flowed over the top of the cove formed a waterfall higher than Niagara Falls! Keep on along the path, now flagged, to pass through a further wooden gate. Keep looking back along this stretch as more and more of the cove is revealed. Pass through another gate and keep on along the path. On many occasions, bird watchers will congregate by this wall with their binoculars trained on the top of the cove, looking mainly for the peregrine falcon, a frequent visitor here. The path then climbs, before dropping down towards a gate by the side of the wall. Pass through this gate and head alongside the wall down the enclosed path down towards another gate in a wall. Pass through the gate and turn left on to the road, following the footpath sign 'Pennine Way - Malham'. Walk along the road back towards Malham village centre. At the road junction keep straight on and pass by the side of the Buck Inn. Keep on along the pavement, past the Methodist chapel and then turn right off the road back in to the National Park Centre car park.